In 1997, one of the most curious and unexpected experiments in "educated" music took place in Holland, and now we're discussing its results. 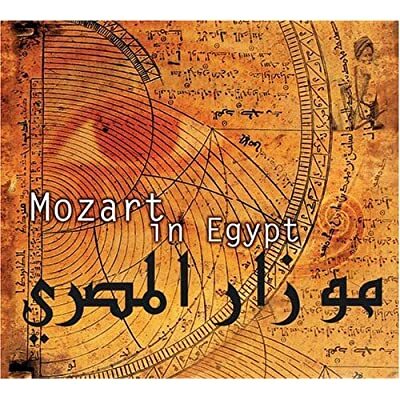 For Classical Music lovers, at least the ones I've introduced Mozart In Egypt to, the album is something curious, out of the ordinary, and something to quickly forget and move on. But no, this is definitely a keeper. It is a natural consequence of the evolution of travel and communication technologies. The evolution of understanding. The idea came out of Hughes DeCourson's mind, influenced by Middle Eastern music as well as the evolution of Western music of the 18th Century, having Mozart as one of the best representations of it. Mozart was a pioneer but mostly a rebel. A punk who dared to smash all preconceived ideas of music. His sounds were not only creative but stormy and questioned for the truth and for something else to mix with. Middle Eastern music was too far away but DeCourson dared to clash these two dissimilar music tendences: European/Western and African/Middle-eastern. It's almost a peace treat between Christianism and Islam. For an hour, Egyptian instruments will be collaborating with Western ones to create something unique. They won't cancel each other. We will enjoy pieces like the Double Quartet in E Flat for Clarinet, Violin, Viola and Violoncello, with the sweet, daring addition of Arghul (single-reed, double oboe), Rababa (two-stringed bowed instrument), Kawala (flute), Tabla, Daff (flat drum) and Sagat (small cymbals attached to the fingertips). Mozart composes, but his work gets blended with traditional arabic melodies and together they flow through a beautiful string of tunes. Purists will call this union unholy and some of them will call on Jihad against the idea. But that idea gave a wonderful album that's here to stay. In Yaman Hawa/Thamos, King of Egypt, a singer with the voice of an angel named May introduces us to a popular Arab-Andaluz melody using a form of improvization that Mozart later will help to glue together. See, the Western instruments make the listener of the Western World feel more comfortable and less out-of-place. But eventually we will fall in love with the Egyptian sounds and will thank Mozart for the trip. Mozart In Egypt is truly a trip, a pilgrimage, more than a "clash" of cultures. A masterpiece? Indeed.